German car manufacturer, Audi is ready to launch its first production model to break the bounds of the Volkswagen (VW) Group’s platform strategy. There has been a bulk quantity of 2015 Audi TT 45 TFSI Quattro S Tronic model has been imported into India, which is clearly says that Audi is gearing up for the launch of the next generation TT Coupe in India. It is based on VW Golf but it is a 2+2 model with a shorter wheelbase and completely different proportions from the VW Golf which puts it apart. In this price range it is the first car to have a virtual cockpit i.e. a 12-inch high resolution LCD display that fills the instrument binnacle which is first of its kind in the India VW Group car. There are other cars also which features this technology includes the new VW Passat and Audi Q7. 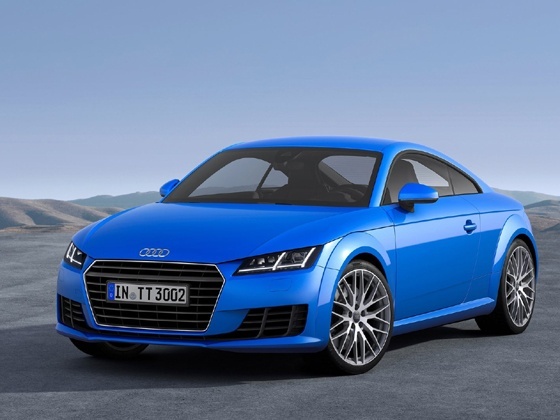 According to the company the inspiration for the Audi TT is the circle. Infinite beauty, infinite fascination. It can be seen in many details of the TT and does not just win over those who are inspired by design, but also those with a passion for exciting sports cars. A seamless blend of luxury and performance. Ergonomically shaped sports seats with integrated head restraints. Pure sporty elegance. Inside and out. The styling features in generation hardly changed, with a larger grill and new lighting arrangement. But under the skin, which is made of aluminium is totally different. From the interiors other features include brown leather sport seats, sporty aluminium pedals, LED headlights and tail lights, full LED instrument cluster, which also acts as navigation screen, parking camera display. The third generation TT is turbocharged and powered by a 2.0l TFSI engine, generating 230 hp power and 370 Nm torque, which is 19 hp and 20 Nm more power and torque respectively when it is comared to earlier generations of TT. It consist of a 6-speed transmission and the AWD system, which enhance the performance of a sportscar. The company assures that it can attain 100 km/h in just 5.3 seconds with a top-speed of 253 km/h. But it still unclear that TT diesel will also be available in India or not. As usual for the Indian market new car will be available through the CBU route from Audi’s Hungarian plant and Price of new TT is expected to be in the range of Rs 55-60 lakhs. Should We Expect Ssangyong Motors to Comeup with A Massive Beast This Year To Hit The Indian Market?